Stir together sugars, peanut butter, butter, shortening and egg in large bowl. Stir in flour, baking soda, baking powder and salt. Cover and refrigerate at least 3 hours. Divide dough in half, keeping one half in the refrigerator. That way, the dough won’t become too warm or sticky to roll. Roll one part of the dough at a time 1/8 inch thick on lightly floured surface. 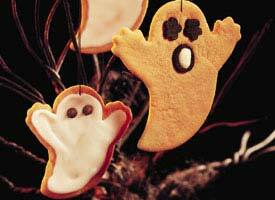 Cut with 3x2-inch ghost-shaped cookie cutter. Place about 2 inches apart on ungreased cookie sheet. If cookies are to be hung as decorations, cut a hole at top of each cookie with end of plastic straw, round pastry tip or sharp knife; cut out holes for eyes if desired. Bake 6 to 8 minutes or until light brown. Cool 2 minutes; remove from cookie sheet to wire rack. Cool completely, about 30 minutes. Combine and stir Creamy Glaze ingredients until smooth. Spread Glaze on cookies. Decorate with candies. Thread string or ribbon through holes to hang cookies. Place the dough between flat wooden or plastic rulers or between 1/8-inch-thick wooden dowels from a craft or home store. Roll the rolling pin over the rulers or rods to make the dough an even thickness.